The Hennick Centre is proud, for the SIXTH year running, to offer upper year Osgoode-Schulich students the OPPORTUNITY to participate in LawWithoutWalls, a groundbreaking international academic program designed by the University of Miami School of Law!!! LWOW brings together 100 students and faculty from 30 Law and Business Schools around the world, including Harvard Law, Stanford Law, Wharton, University of Sydney, University College London, IE Business School, and Peking University School of Transnational Law. With guidance from leading academic, lawyer and entrepreneur mentors, teams of students conduct guided, collaborative research to identify a problem related to law, business, and technology and develop a practicable solution (including prototype and business plan). Students participate in the for-credit LWOW Original or LWOW X programs during the 2019 Winter Term. JD/MBAs can only participate during the years they are enrolled in Osgoode, not Schulich. The program is being offered as a 3 credit independent study course supervised by Prof. Ed Waitzer – Co-Director JD/MBA Program, and Director of the Hennick Centre or another member of the Faculty as agreed upon, grade received decided by Osgoode Faculty supervisor, not LWOW. The student’s participation registration fee in the program is funded by the Hennick Centre. Participating students in different cities work collaboratively through weekly virtual team meetings and virtual thought leader sessions to define a set problem in legal education or practice and design a solution. Students, faculty and mentors are introduced to their team members during a two-day kickoff conference. Team meetings held virtually (biweekly or as often as needed) to fine-tune a problem and develop a solution to that problem. The program concludes with a two-day closing conference where each team presents their business plan to a multi-disciplinary panel of judges including venture capitalists. LWOW and LWOW X follow the same curriculum. The only difference is that the LWOW kick off and closing conferences are held in-person. The program’s application window is now open, and closes October 31, 2018. 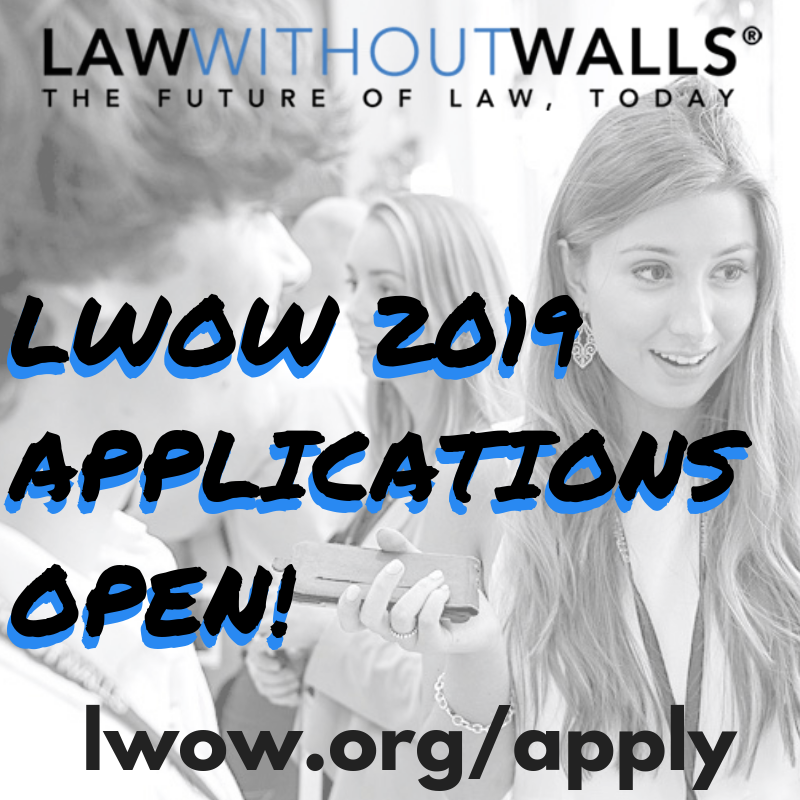 LawWithoutWalls program runs January – April 2019.